"In the fall of 1982, four backpackers set out to hike and camp on the Appalachian Trail. Four days later their disfigured bodies were found by state police. The producers of Farmhouse return to the Twin Cities Horror Festival with a chilling account of getting lost in the woods and coming face to face with the terror that lies within." 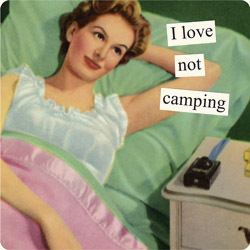 I HATE CAMPING. Therefore, I am an excellent audience for a horror show that involves camping. As you enter the theater, atmospheric haze already sets the mood. Julie (Debra Berger) and Sam (Mike Fotis) are setting up camp (well, Julie is--Sam mostly talks). 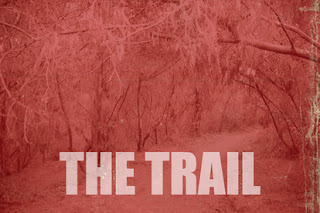 They are waiting for Sam's sister Ruth (Keely Wolter) and her boyfriend Glen (Lucas Vonasek) to join them, though they've gotten a bit off the trail. As they wait and chat and argue, and complicated family issues emerge and all is not as it seems. This show is all in the writing. I love the naturalistic dialogue and the depiction of very realistic relationships. So when things start to go a bit off-key, it's even more chilling. If you've ever strained your ears to try to make out a mysterious sound in the woods, or tried to see beyond the firelight to the shadows in the trees, you will love this show. If You're Sensitive and/or Delicate: There's a fair amount of smoke and haze in this show, if you're sensitive to that kind of thing. Don't forget to check out Twin Cities Horror Festival's handy genre and ratings guide.